Marol is a locality in the suburb of the Andheri (East) in Mumbai, India. The area has been inhabited for centuries,  successively coming under both Portuguese and British rule. Marol consists of the areas Marol village, Marol Naka, Marol Depot, Marol Maroshi Bus Station, Military Road, Marol Pipeline, Vijay Nagar, Bhavani Nagar, parts of JB Nagar, and parts of Marol MIDC. It is near to the international airport. The Marol-Maroshi Road stretches from Marol Naka up to Maroshi Naka (in Aarey colony), beyond which is the Picnic Spot. Marol Mapkhan Nagar and the Marol Church Road are the two diversions, the latter one also leads to Marol Pipeline. Marol Village is home to a large number of Christians, with the St. John the Evangelist Church which has been established since 1579  and its high school. Marol Fire Brigade is at Marol Naka. Police Camp is at the end of Marol and is home to the families of people working for the Maharashtra Police. It is mainly the base camp for the State Armed Constabulary. The oldest housing colony in the area is a group of 11 buildings on Military Road called Blossom Society. The first occupants arrived here in 1968. Marol is strategically located close to the Western Express Highway and in close proximity to Andheri railway station. Located off the Andheri-Kurla and Andheri-Ghatkopar link roads, it has good east-west connectivity. 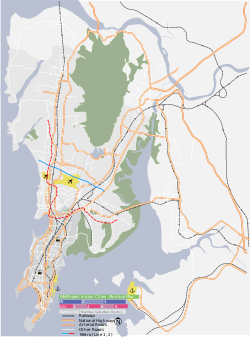 There is excellent bus connectivity to all parts of the city of Mumbai. Marol also has close and easy links to Mumbai's three suburban railway lines - Andheri (Western), Ghatkopar (Central) and Kurla (Central/Harbour). Marol is currently served by the Marol Naka station on Line 1 of the Mumbai Metro. It will also be served by a station on Line 3 which is under construction. The Terminal 2 (locally referred to as the International terminal) of Chhatrapati Shivaji International Airport is situated 1.4 km from Marol Naka. ^ "Marol, a village where Portuguese interfuses seamlessly with Marathi". Indianexpress.com. 14 January 2016. Retrieved 19 August 2017. ^ "St John Marol - Home". Stjohnmarol.com. Retrieved 19 August 2017. ^ St. John The Evangelist Church - About - Google. Maps.google.co.in. Retrieved on 2013-07-16. ^ Worms in supply water: Marol residents blame road repair work. Indian Express (2009-05-27). Retrieved on 2013-07-16. ^ Marol Maroshi Best Bus Depot. Maps.google.co.in (1970-01-01). Retrieved on 2013-07-16. Wikimedia Commons has media related to Marol.